Japanese Prime Minister Shinzo Abe has urged his government to find quick solutions to prevent the leaking of irradiated water from the Fukushima Daiichi nuclear power plant which went into meltdown following a massive earthquake in the northeast two years ago. His statement came as plant operator Tokyo Electric Power (Tepco) said that the radioactive water was pouring into the Pacific Ocean at a rate of 300 tons a day. Abe, who called the leak an “urgent issue” has asked the Ministry of Trade and Industry to assist Tepco. Japan was hit by a 9.0 magnitude earthquake in March 2011; the subsequent tsunami killed 15,000, left 315,000 people homeless, and caused a number of explosions at the plant. The consequent damage to Fukushima will require at least 40 years of repair – to infrastructure and the environment – at a cost of $11 billion. 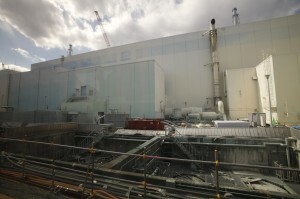 Tepco, which environmentalist groups such as Greenpeace accuse of covering up the sea leakage until recently, has suggested possibly using the technology used in tunnel construction to plunge thousands of tubes to flood the ground surrounding the plant with powerful coolants. These would then ‘freeze’ the ground soil around the plant and prevent irradiated water from leaking into the Pacific Ocean. The government may have to step in to provide funding for such a massive project. Greenpeace has urged Japan to seek international expertise to assist in finding solutions to end the contaminated leak.